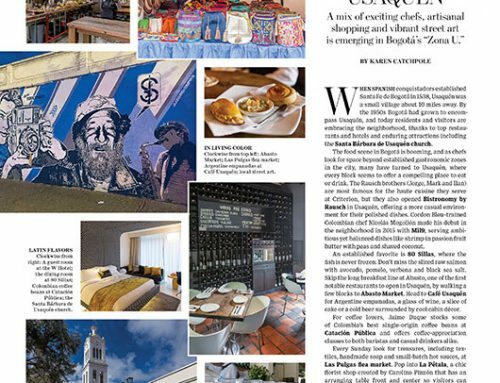 The world is increasingly full of hotels and resorts run by local communities and indigenous groups. 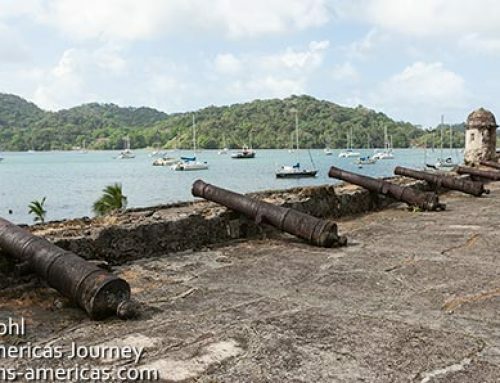 Many claim to give guests the chance to gain true insights into the cultures they’re visiting but, too often, what travelers get is a pre-packaged, buffed up, sideshow version of reality. 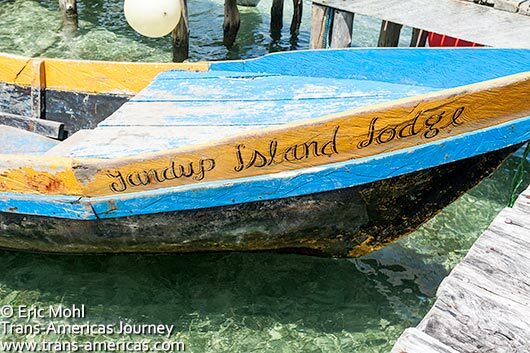 Yandup Island Lodge, run by the Kuna (or Guna) people, goes beyond the beauty of the Kuna by actually delivering on its promise to help guests understand Kuna life, traditions, and challenges in the San Blas Islands of Panama. 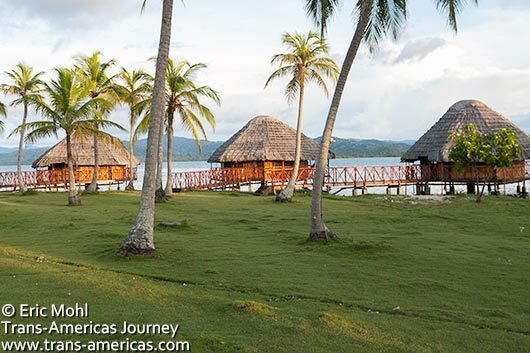 Our destination: Yandup Island Lodge in the Kuna Yala, or San Blas Islands, of Panama. 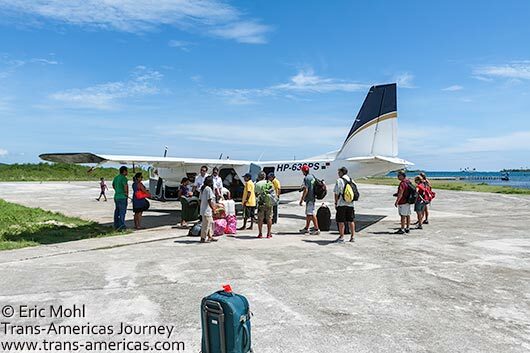 Though most of the islands in the San Blas Archipelago, also known as the Kuna Yala, are uninhabited, some are packed with Kuna villages, like this island we flew over on our way to Yandup Island Lodge. Any time you get into a small plane you know that take off and landing are going to be extra exciting. 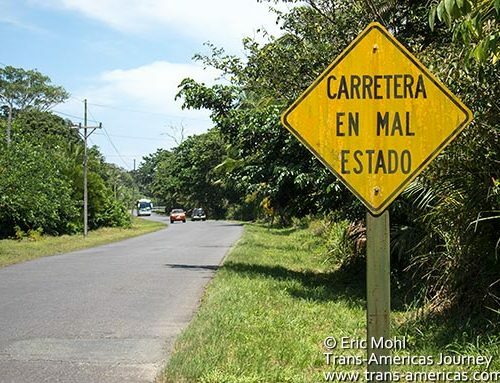 Still, we weren’t quite prepared for the fly-straight-at-the-mountain-bank-hard-then-drop-straight-down-onto-the-ground landing that the pilot artfully made into the dinky, waterside Playon Chico airstrip. Safely landed at the Playon Chico air strip on our way to Yandup Island. 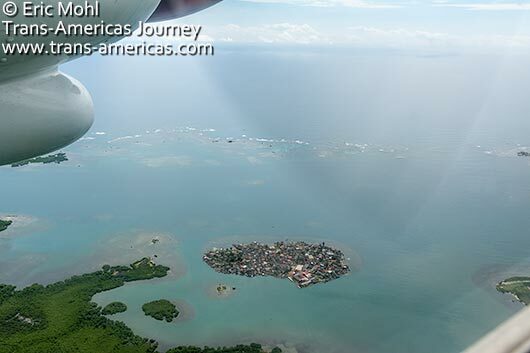 Back on solid ground, we got our first glimpse of the San Blas Islands or Kuna Yala archipelago, the name given to a chain of more than 350 islands, mostly uninhabited, that is governed by the autonomous Kuna people within Panama. 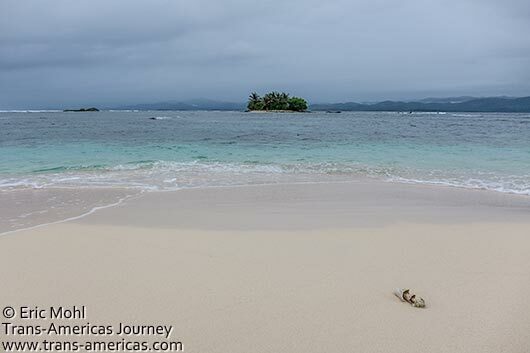 One of the many tiny uninhabited islands in the Kuna Yala archipelago of Panama, also known as the San Blas Islands. While most of the islands in the Kuna Yala are uninhabited, some are packed wall to wall with Kuna villages. A few others, like Yandup Island, are used for hotels. Transportation at Yandup Island Lodge. After a five minute boat ride from the air strip we arrived at Yandup Island Lodge which occupies a small island owned and run by a Kuna family. 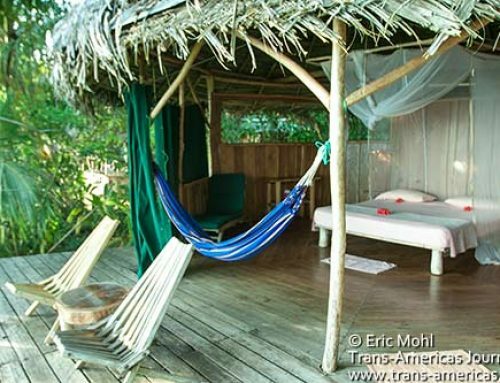 The round, stand-alone, stilted bungalows are basic but comfortable with nets over the beads, private bathrooms, and hammocks on the porches. Bungalows at Yandup Island Lodge. 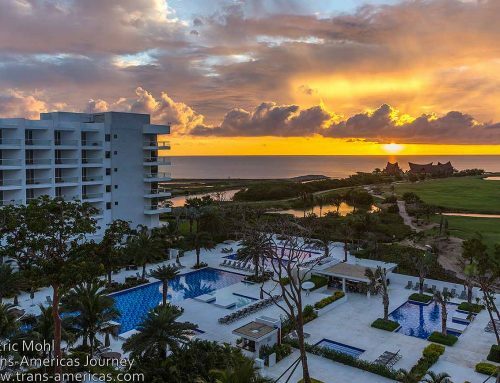 The island is picture perfect with lapping waves, swaying palm trees, and gentle breezes and no Wi-Fi or TVs. 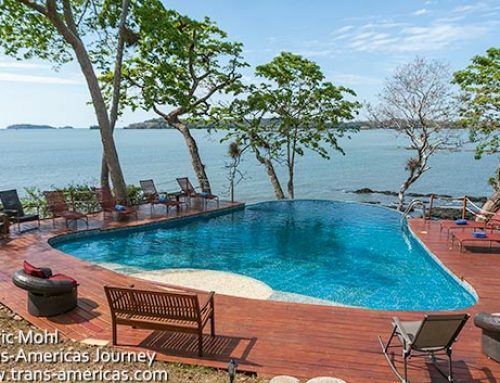 The place is partly run on solar power and water is piped in from a waterfall on the mainland. If you can’t relax here there’s no hope for you. 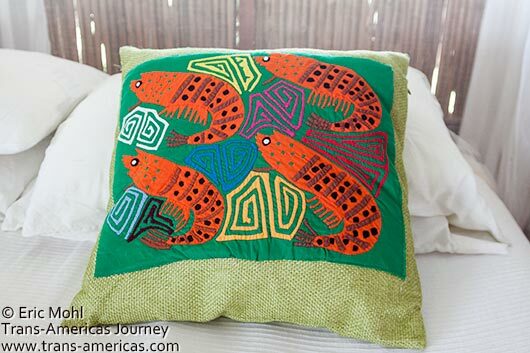 A traditional Kuna mola decorates a bed pillow at Yandup Island Lodge. 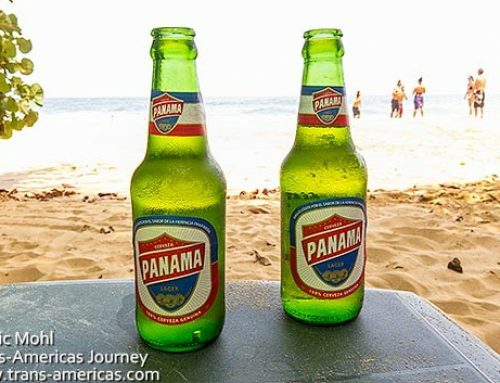 The Kuna, the largest indigenous group in Panama, came to Panama from Colombia and successfully resisted assimilation during Spanish colonial times and thwarted later Panamanian efforts to suppress their culture. 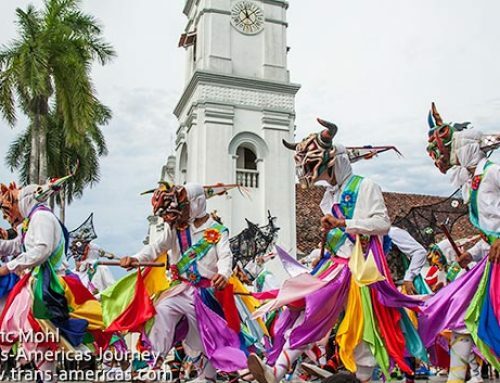 In 1925 the Kuna staged a revolution and were officially granted cultural autonomy by the Panamanian government. 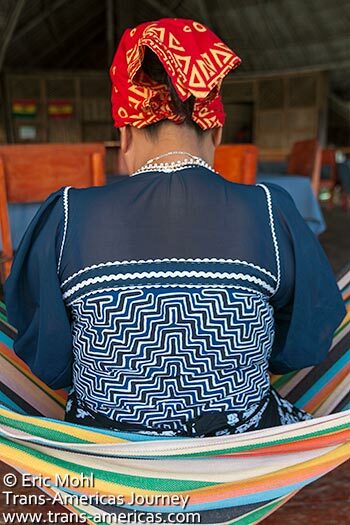 A Kuna woman wearing a traditional top which incorporates vibrant, geometrically designed, handmade fabric squares known as molas. 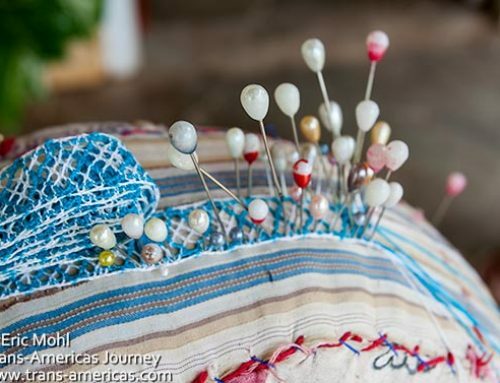 Kuna culture remains remarkably intact including the beautiful traditional dress of Kuna women and their hand-made fabric molas which are known around the world. That’s about all we knew about the Kuna before we arrived at Yandup, but that was about to change thanks to the lodge’s wonderful Kuna staff who were open, friendly and patient as we peppered them with questions. When we asked these Kuna employees of Yandup Island Lodge why they didn’t wear the traditional arm and leg beads they proudly explained that they were “modern”. 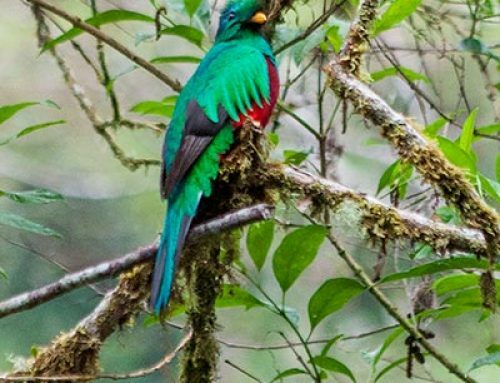 For example, when we noticed that some of the female staff members did not wear the traditional Kuna leg beads (called wini) and arm beads (called chaquira), we asked them why. Ruby, who could make a stone smile, proudly answered soy moderno (I’m modern), then laughed. Another female employee explained that she had chosen not to cut her hair for the same reason even though short, almost mannish hairstyles are common among Kuna women mostly, we were told, for comfort in the heat. 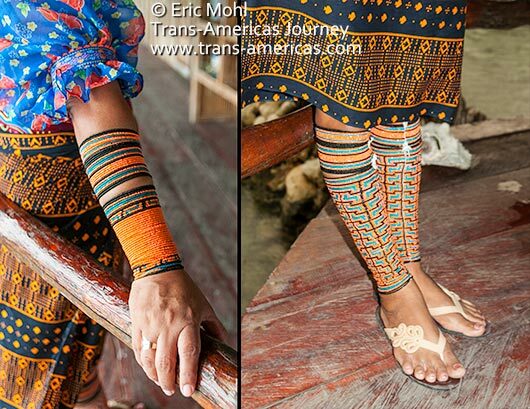 It takes Kuna women about a day to make each of the traditional beaded leg and arm wraps, called wini and chaquira respectively, though some Kuna women are choosing not to wear them at all. 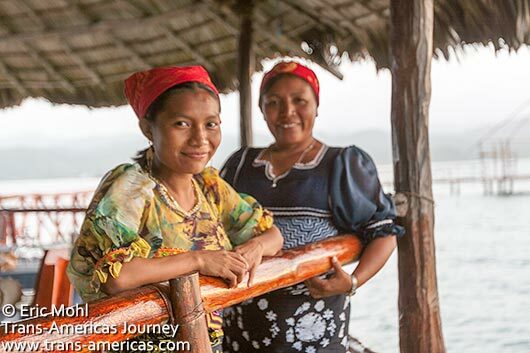 While it was easy to imagine an idyllic Kuna lifestyle while relaxing at Yandup Island Lodge with its views and spacious lawns we saw a different reality when we visited Playon Chico for a guided look at life in a Kuna village. 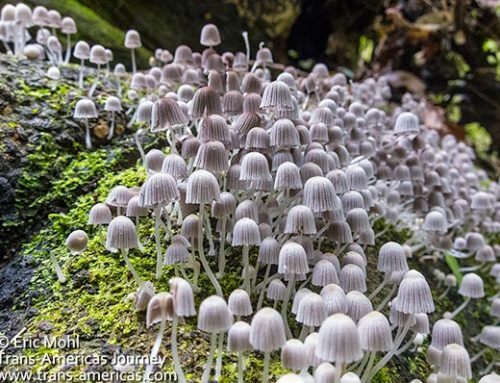 The first thing we were struck by was the crowding. When the majority of your land is composed of islands, many of them tiny and some of them sinking and eroding due to environmental pressures, space is a luxury. 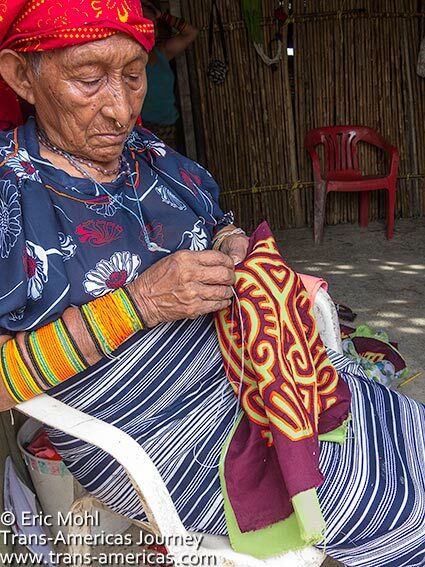 A Kuna woman in Playon Chico works on a mola which is traditionally made using two colors depicting a geometric pattern which can be abstract or represent animals or more elaborate scenes. Playon Chico is the largest Kuna village with more than 3,000 people living shoulder to shoulder on a small island which seemed as if every square inch was covered in something man-made. 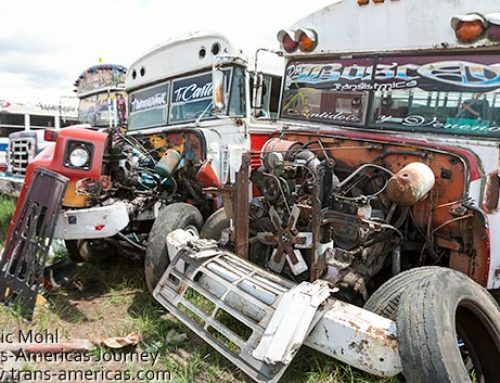 Kuna families typically have five to seven kids, so children make up more than 60% of the population in Playon Chico which gave the village a “Lord of the Flies” vibe. 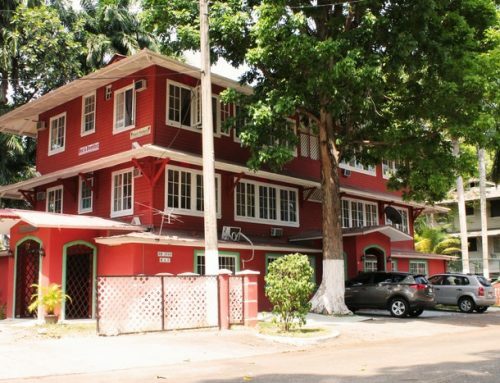 Garbage was a problem and visible everywhere and the community was struggling to find garbage management options that were better than simply making huge piles along the water line. 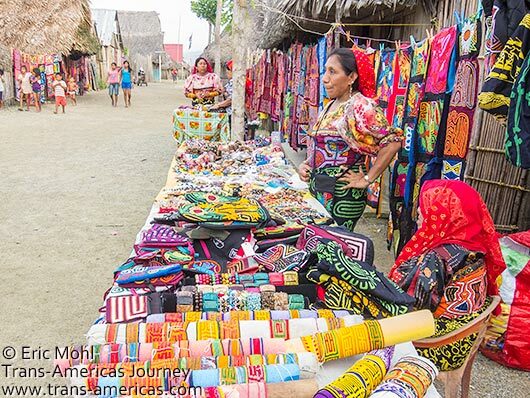 Kuna women on Playon Chico set up stands along the village’s sand roads where they sell their hand-made molas, traditional beaded leg and arm wraps and more. Mixed in among the traditional thatch-roof houses, tiny shops selling daily necessities, and the volleyball courts (the Kuna love volleyball, perhaps because they don’t have space for soccer fields) we walked past a number of make shift open-air shops where Kuna women were selling beads and items made from their most famous handicraft, the mola. Made almost exclusively by women, each vendor seemed to have her own particular style when it came to colors and designs. Though Kuna men have mostly stopped wearing traditional clothes in favor of jeans and t-shirts, most Kuna women still wear blouses made from molas and elaborately patterned sheer fabric, colorful arm and leg beads and bright head scarfs. 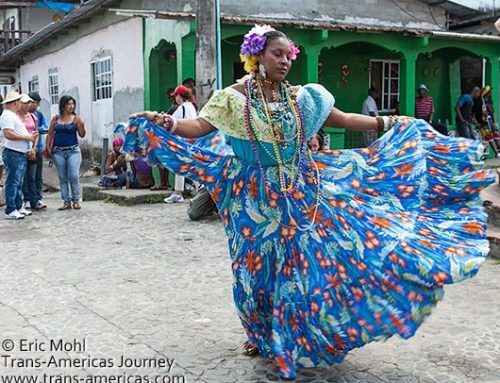 In Playon Chico we learned that even within this traditional outfit there was room for fashion with colors going in and out of style and women making trips to specific fabric stores in Panama City to get the latest patterns for blouses. 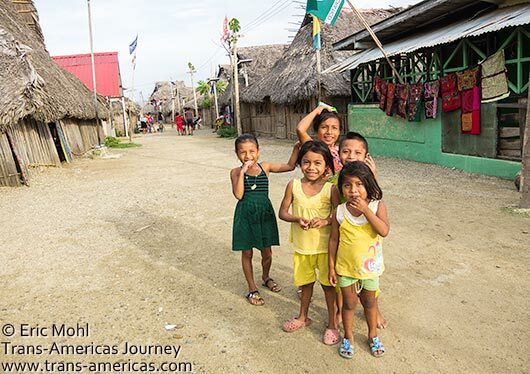 Kids make up 60% of the population of the Kuna village of Playon Chico. 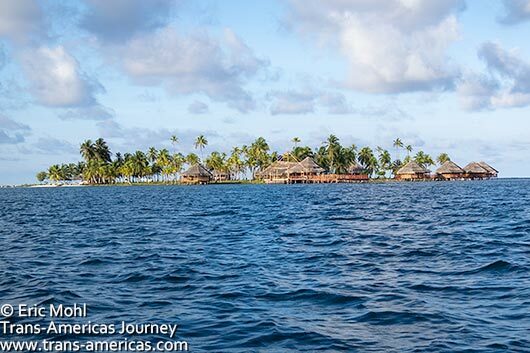 Not sure if I’ll sail to Colombia when the time comes to do so in a few months, but if I do, I’ll stay here during the stopover in the San Blas Islands!